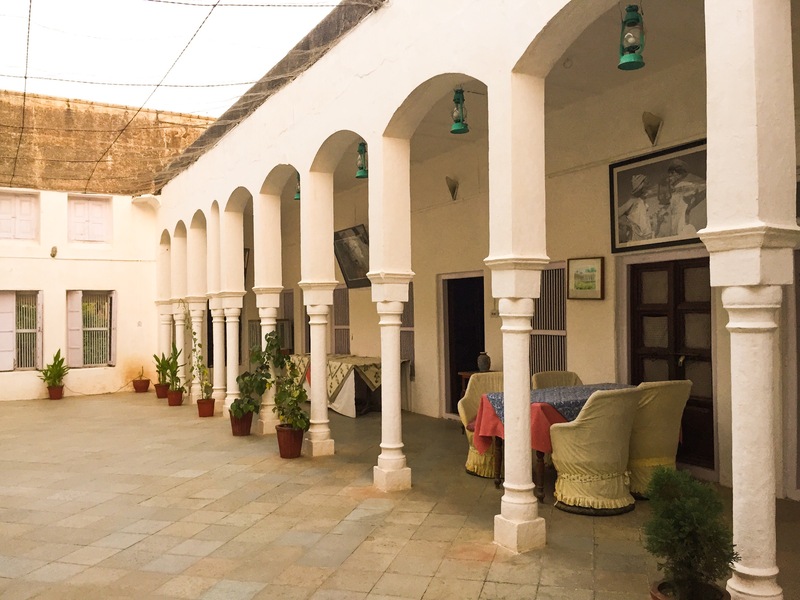 The Piramal Haveli in Bagar is truly a stunning Shekhawati Haveli. Approximately 40 kms from other hotels in Mandawa, Piramal Haveli is the closest Shekhawati hotel to Delhi (a mere 5 hour drive). We discovered this property on our search to a weekend getaway from Delhi. We had already exhausted the more popular options including the Hill Fort Kesroli, another Neemrana Hotel property. This trip had to be a special luxury getaway as it was the boy’s birthday and thus started the research. Just as I was about to lose hope, I chanced upon Piramal Haveli and was totally in love with it. More so, because the Shekhawati region in Rajasthan was the only part that was left unexplored for us. So this was the perfect amalgamation of luxury and local discovery! Piramal haveli stands tall right in the middle of the lost town of Bagar. You will underestimate it, looking at its unassuming entrance but once inside, it makes quite an impression. There are little details that need to be paid attention to, couple of loose ends that need tying together but you’ll enjoy its age old stories, its depreciating twin and its ability to make you feel like royalty. It was built in 1928 with a large open garden and two pillared courtyards painted with colourful kitsch frescoes of flying angels, airplanes, and gods in motor cars. The suites’ walls are adorned by original prints by Raja Ravi Verma Press and posters of King George the Vth. It was like walking into history itself. The Piramal Haveli is an excellent heritage property but only one out of the twin havelis have been converted into the hotel. The front facade of the property includes the other half of the twin haveli but has not been restored and feels like an unfinished book. It needs to be better cared for. We were served our evening coffee in silverware and that really felt royal ! The size of the bed, the warmth and the prompt service of the staff, the breakfast, all of it was royal indeed. The hotel serves only vegetarian food and houses no bar. All you pure bred punjabis, give it a miss. We did not know that the hotel does not serve non vegetarian food or alcohol so we were a bit disappointed as we enjoy those sins. After posting a review on tripadvisor, I was informed that the website does mention this but I had missed it. I went looking for it on their website and the information is nested away into another page. So, you’ll thank me for this review – non vegetarians and vegetarians both ! Vegetarians, go ! Enjoy yourselves at their buffet. They served us a seasonal local dinner that included, can you imagine, tinda, sangri, paneer (Cottage Cheese), dal (lentils), chawal (White Rice), phulkas (Indian flatbread) and sevai for dessert. At face value, I was disappointed but It was the best tinda and sangri I’ve ever tasted ! If you are planning a family vacation, this is the perfect getaway for you. My parents are vegetarians and I could just imagine how happy they would be at this property. 1. The room was a little musty when we entered but it got better after an hour or so. 2. No wifi. This can prove a boon to those looking to spend quality time with their spouse and family but it has become an expected service everywhere these days, so should be included. Pingback: Adventures on a short road trip from Delhi - Alwar | Luxury or Budget, Travel for the Experience. Pingback: Your complete list of Places to visit in Rajasthan, India - which ones will you choose?